Sol LeWitt once observed that in his wall drawings there are ‘two kinds of form—the lines, and the explanation of the lines. Then there is the idea, which is always unstated.’ Something similar might be said of Simon Starling’s works. Each one has two visible components—an object or group of objects, and a text that explains how the object was made. But there is also a third component that remains invisible. As with LeWitt, this third component has something to do with ‘irrational thoughts followed absolutely and logically.’ The most obvious difference, of course, is that whereas LeWitt’s ideas and materials seem to be abstract, Starling’s engage in the stuff of history; in the text for ‘Burn-Time’, 2000, the artist claims that ‘the simple act of producing and cooking a number of eggs is mobilised as an act of historical investigation and interpretation’. Perhaps a statement of absurd grandiosity? But understanding what that means is highly variable, depending on whether the emphasis is on absurdity or grandiosity—whether Starling is being sly or earnest. The answer, of course, is both. And this art depends absolutely on Starling’s ability to walk a tightrope. On the one hand, his work could easily devolve into a do-gooding campaign on issues of ecology, colonialism, and so on—‘Quicksilver, Dryfit, Museumbrug’, 1999, addresses the worthy topic of Holland’s relations with its former colony of Surinam in the final form of part of an aluminum boat and a puddle of cast aluminum. Or on the other, it could amount to a self-aggrandisingly idiosyncratic head game focused on just how many resources an artist can inveigle the institutional art system to let him waste. Starling himself cites Georges Bataille’s notion of a general economy based on expenditure rather than production. Curator Philipp Kaiser notes, in his interview with Starling in the exhibition’s catalogue, a general resemblance to strategies of circuitousness and inefficiency practised by the German artist Andreas Slominski—a connection Starling carefully neither acknowledges nor denies. Starling’s new work for this show, ‘Shedboatshed (Mobile Architecture No. 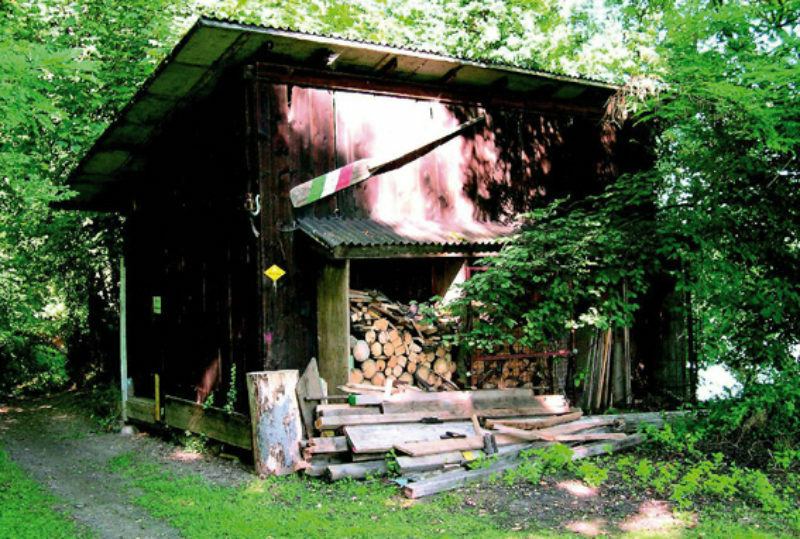 2)’, 2005—a wooden cabin that is broken down to its component lengths of wood, which are in turn used to build a boat that sailed down the Rhine to Basel so that it could be dismantled and the shed reconstructed out of its original materials—exemplifies this ambivalence. One admires the economy embodied by a building that could serve as its own mode of transport, even as one remains aware that this economy is purely notional and that a greater efficiency could probably have been achieved by just loading the thing on a truck. Despite any appearances to the contrary, the upshot always remains firmly within the concerns of the aesthetic, as made abundantly clear by a work like ‘Three Day Sky’, 2004, which (as its text says) ‘uses convoluted means and a great deal of time to create a simple painting’, a blue aerosol atmosphere on the ceiling à la Katharina Grosse. Starling’s objects are not typically as pretty as that, but (reflecting his fascination with modern design) they are always visually noteworthy, never abject or inconspicuous. They count on you looking first, reading afterward—reading because the object has piqued your fancy.